Adnams is a brewery with a lot of history. However they are a brewery that has also shown a desire to move with the times, be that through the beer they're brewing, their branding, or how they engage with their customers. They produce a range of traditional ales, interspersed with some interesting, modern twists and the occasional special release. Since being acquired by the Adnams family in 1872, they've remained independent and focused on retaining their links to their Southwold, Suffolk home, although their beers are available nationwide these days. Over the past few years, I've enjoyed a good number of their beers, with the delicious Ghost Ship on cask (first sampled in a Wetherspoons in a West London business park of all places) being a particular favourite. Fittingly, it's a recipe based on one from Adnams' archives with Citra and other American hops providing a modern twist. This was originally a seasonal beer intended to available in the Summer months. However, the response of the drinking public saw it become a permanent fixture and made available in both bottle and more recently canned form. Adnams, in my view, have a fantastic online and social media presence and are one of the most engaging of the breweries I follow across all platforms. As an example, a couple of years ago, a friend mentioned in a tweet that he was looking forward to visiting the brewery on his birthday. Their marketing team saw this tweet and made him feel special on the day, sending him away with a few beers to celebrate. 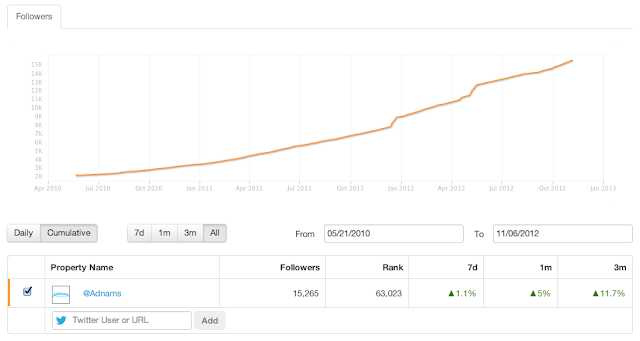 That kind of engagement is priceless in terms of driving loyalty and he still talks and tweets about them. Sarah Howe (@sl_howe), who tweets for Adnams, attended the European Beer Blogger's Conference this year (coincidentally, also in May) to present the newly launched Ghost Ship as part of the speed tasting session and it was interesting talking to her about the importance they attach to how they engage with customers on social platforms. Anyway, on to the beer in hand! With increasingly high beer duty being a hot topic at the moment, the recent halving in duty for beers below 2.8% ABV has provided a rare break in the storm. The fact it was offset by a huge increase in duty for high strength beers is not lost on me, but the cut, most likely made to favour supermarkets and other mass producers, has provided an incentive for brewers to innovate in arguably the most technically challenging of categories - flavourful low strength beer. With no significant malt base to underpin them, low strength beers can be watery and can also struggle to maintain mouthfeel, head and any lasting flavour on the palate. A guardian blog post discussed some of the products released in light of this drop in duty, and it doesn't make good reading. 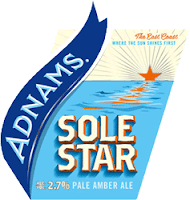 Adnams' effort, Sole Star, is described in their tasting notes as a 'full-flavoured and great tasting pale amber beer, with a light floral/citrus aroma, gentle caramel notes and a good level of bitterness'. It comes in at 2.7%, so qualifies for the lower duty rate, enabling Adnams to sell it online at a very reasonable £10.99 for 8 bottles. The bottle I sampled was decent enough, and my glass emptied quickly and left me wanting another, but in all honesty this is not probably a beer I'd drink lots of. If you go up another percentage point, you'll pay more for the pleasure given the standard rate of duty, but can enjoy much more flavour in beers such as Brewdog's Dead Pony Club, Redemption's Trinity and Kernel's Table Beer in what I'd still consider the sessionable 3.x% ABV bracket. I applaud Adnams and other breweries who've released products in the lower duty bracket but hope and pray that the government increases the lower duty threshold an extra ABV percentage point (or even half a point!) in future. Flavourful beer within this lower duty rate category remains something of a holy grail. Thanks to Adnams for sending the bottle through for sampling. small correction Ghost Ship was originally available only during the autumn months around Halloween suprisingly enough...as it was initially launched around back end of September 2010.and the relaunch in May this year was a bit of a second wind release anyway as it had already kind of gone full time by then for some months. Thanks for the correction Stono. That makes sense as I first tried it during the Wetherspoons beer festival in 2010, which I guess would've been around late October or early November given this year's is running at the moment. My pick of the ones I've tried this time has been the Avery brew - really nice. Twitter is indeed something of a bubble and I agree that the majority of the beer drinking public generally don't use it. My experiences with Adnams have been positive but, thus far, I haven't been critiquing them so I can comment on that aspect personally. Thanks for taking time to read and comment on this post! Another small correction. Southwold is in Suffolk, not Sussex. Oh dear, thanks Justin, I'll correct that above. That's what you get for writing blog posts late at night!